The blue door is inviting. I cautiously knock feeling some apprehension. What will she say when she sees me? Will she recognize me? It's been such a long time. My anxiety begins to build as I wait for her to answer. What if she rejects me? I hear a small dog barking in the background. I hear someone moving around inside. I knock again, lightly. The television is on, I hear it in the background. Shuffling sounds come nearer to the door. The door creaks open. I see the aged version of the woman I remember. This is my submission for the flash fiction challenge, Flash Fiction for Aspiring Writers. We are given a photo prompt and approximately 75-175 words with which we create our stories. Everyone is invited to participate in this challenge. For more information, click HERE. I know, this photo prompt lends itself to a lot of different stories! Thank you so much, Sadie! beautifullllllly written – and left to leave us hanging. Well done dear P! Thank you so much, Lady Lee! Thank you so much, Jade! It’s a simple tale of coming back home but you have written it in such a way that as a reader I wasn’t expecting such an end. Yes, I’m not exaggerating but you have successfully created a suspense here. Thank you so much, Madeeha! Thank you for such a kind comment! Beautiful story. The ending was just right. I’d love to know what happened in the intervening years. Lovely Joy, that’s a heart stopping moment to have the door open on a person you haven’t seen for a long time and wondering what they now look like. Enjoyed this tale very much. Thank you so much, Michael! It certainly would be a heart stopping moment! Yes! Definitely, a sweet reunion! Lovely Priceless, just lovely. It leaves me imagining so much. Great job building suspense. I hope his Mama welcomes him back! Thank you Mandi, I’m pretty sure she will! LOL! You know what they say, great minds think alike! Hahaha! Yes, that is true. A lot of “family” and “home” stories. I didn’t realize that was the crux of my feelings until I started reading all the other submissions. As always, I write my submissions without reading others. I don’t want my thoughts to be intertwined with those of others. I understand. There are a lot of people that write their stories prior to reading the other stories submitted. Sometimes I do and sometimes I don’t. Like you, I don’t want my story influenced by someone else’s story. Good to know it is Mama. Nice ending! Thank you so much, Jahnavi! I can feel the anxiety as she waits and knocks! Very heart warming and strong PJ! Thank you so much, Lynn!! Just wanted to let you know that I am taking a semi-break from the blogs. I am answering my comments and running my challenge but that’s about it for a little while. I just needed a break. Oh yes! All is well, I’m just extremely tired and a little burned out. I just wanted to tell you that so you would know why I’m not reading your posts. I’m not reading posts right now. Did’t see that coming and it was very touching! Great take, dear! So loooove the twist! Thank you so much, Rosema! You are my sweetest fan! 😀 😀 LOL!! Oh, it seems that you needed to write a little more. It seemed to promise more…..
Great story! I love the build up and anticipation. Now I want to know more: why has so much time past? Why does she fear rejection? The possibilities are endless, and my imagination is running wild! Thank you Kay! She had been a prisoner of war and was just getting back home. 😀 (That’s honestly where my imagination took me). Have to ask, of course, will mama recognize her and welcome her in? Hope so! I thought you did a great job creating anticipation. Now it makes me wonder how this person is received by their mother? Did they part on bad terms or good? Will Momma even recognize them? As I was writing it, I saw her (or him) as returning from being a prisoner of war, but it could be almost anything. I also saw her as being overwhelmingly happy to see her child again (and vice versa). Awesome! From your perspective and other readers, the possibilities are endless. Great lead up to his once again seeing his mother. I do hope it was a joyful one for both of them. The feeling of his anxiety came through your writing. Great job, Joy! 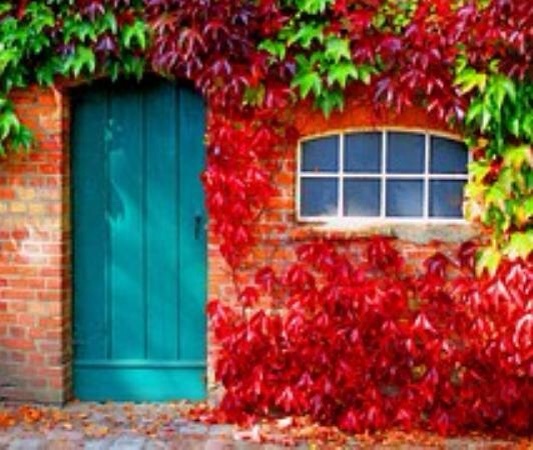 What a beautiful picture and the blue color of that door is gorgeous!! What a sweet story PJ! So much in so little…you really are so great at being able to tell so much in a story with so few words as is the point. Thank you so much, Deb! I really appreciate the kind words! Flash fiction is fun, especially when I can think up a good story. LOL! Awww, such emotions in this short story. I’m afraid, the mother might not recognize her. Flash & Fiction and above that a Challenge. Have a nice week end Dear! Thank you Shiva! You have a nice weekend too! Can you tell me what’s the time right now at your place. Are you very far from Deb or how far are you? It’s almost 12:00 noon here. It should be around 2:00 pm in Deb’s area. Its past 11 pm here, so you are almost very far west than her she is almost 10 hrs behind me. I feel its very interesting you see. Technology has made us to be so near and dear. Yes, I agree! I have my computer set up with clock at different points in the world so I can have an idea what time it is in different places of the people I blog with. It is very interesting! You are probably 1 day ahead of us here in the U.S. It is Saturday here. It is probably Sunday where you are. No No it cannot be I am still in the Saturday’s tail end. Its exactly 11.45 pm here now. Saturday finishhhhhhhhhed. Oh, okay, I see. There is almost a 12 hour difference in our times. I am going off to bed in a few minutes. Go see my Angel and The Healer of Hearts. Sure you shall like them. How do you set up that clock at diff points to show you simultaneously. Its interesting to know, hope I would do that way. All computers have the option, we should know how to do that isn’t? I use an Apple iPad. It has the World Clock Options. I just select the different areas around the world I want a clock for. It shows me 5 clocks at the same time. I use it a lot. Shiva, if you don’t use an Apple product, can you get apps on your computer? I would think they have apps for clocks that will allow you to have the same thing on your computer. I think so, I will see to that. Display on the computer is more important.